This was indeed a Blue Christmas. We had blue carpet installed in our blue room. Elvis' Blue Christmas played on a regular basis throughout the month and on Christmas Day we had a very blue Christmas. It was Awesome. We woke up early and checked out the stockings to see if Santa thought we had been Nice this last year (Of course we were on the Nice list). We had a traditional Buckaroo Breakfast and we were off to the slopes. I still ski - two skis, two boots, two poles, helmet, goggles, gloves and so many layers I resemble the Michelin Tire Mom. 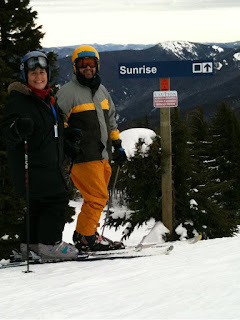 My hubby still skis too but the kids have all gone over to the darkside and they are all snowboarders. Just FYI - in case you are not a skier - when you are up on any mountain the ski runs all have names and they are all categorized by difficulty level. The easiest runs are green circles, the intermediate runs are blue square, and the most difficult runs are black diamonds. There are also expert runs that are double black diamond - sort of like a double dog dare. It was so much fun for me to watch my kids shush down the hill on their snowboards. 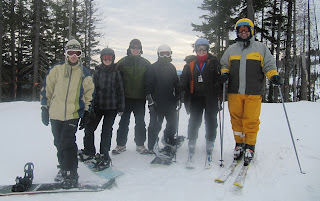 The older kids started skiing when they were 6 and 7 and then moved pretty quickly on over to snowboarding. But the younger two were on skis at 3 and snowboarding just about the time they started first grade. So they hardly remember life before snowboarding, cell phones, and online multiplayer video games. I am more of a social skier. In high school there was a bus that took us up to the local ski resort where I took lessons for a couple of years. My favorite day was always crazy hat day. But that's another story. Then I took a break during college and while the kids were little. When I did start back up I took very informal lessons for a while and always tried to ski with people better than me so that I could watch what they did. But its still pretty early in the season and the week prior to Christmas was pretty jammed packed with activity leaving me sort of pooped. So, I stayed on the blue square runs for the entire day. Fortunately for the kids there are lots of fun black diamonds that cut off of the blue square runs. 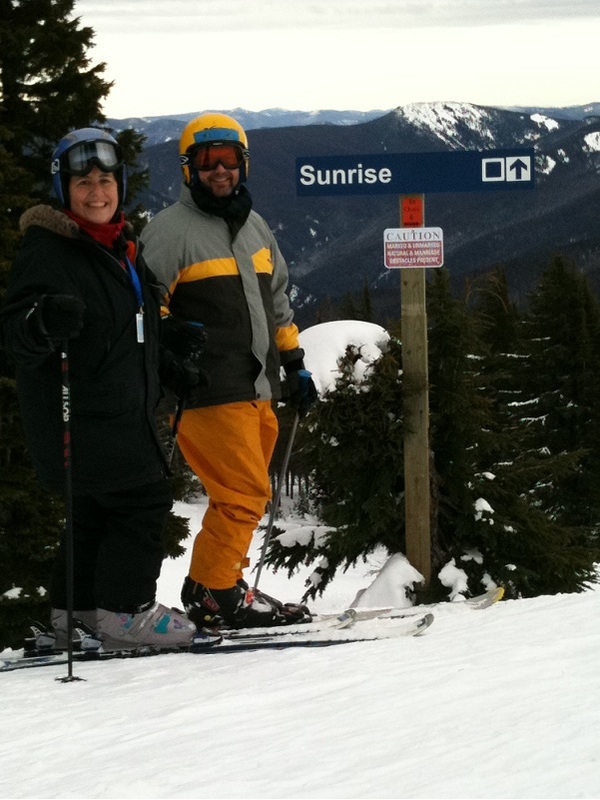 They took off in pairs and would meet me back at the chair lift. 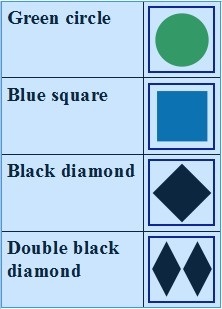 So even though I may have diamonds in my future, right now I am rocking the blue squares. This year was an all around Blue Christmas. And I loved every minute of it.